Everything for Ana: Giveaway: $150 Amazon Giftcard from Tip Hero! 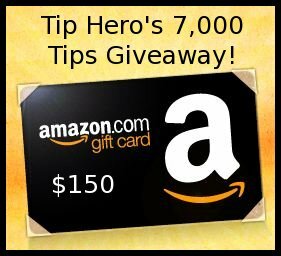 Giveaway: $150 Amazon Giftcard from Tip Hero! For years, Tip Hero has been proud to share helpful tips that help our community save money. It seems like only yesterday that Tip Hero was a collection of a couple hundred tips shared by us and our amazing readers. Now we are very pleased to announce that we have reached 7,000 money-saving tips on Tip Hero (and growing)! And we thought, "what better way to celebrate a milestone like this than to host a giveaway that would offer all the chance to win something that would save more money?" This giveaway begins on February 6th and will run for 2 full weeks, closing on February 20th at 11:59pm US Eastern time. Open to residents of the United States and Canada, 18+. Enter below for your chance to win this excellent prize. Just fill in the PromoSimple form below for your chance to win. Also, be sure to come back daily for more opportunities to enter. Good luck to all! Giveaway : Shabby Apple $50 GC for spring! Special Valentine's Day Event at The Rosy Snail.